The MetaStock Traders Kits are by far our most popular packages for ASX traders and are excellent value for money. With the return to local data in Metastock Version 15 and 16 DC, we can now offer you 3 choices of the discounted Metastock Traders Kit package. (1) The NEW Ultimate Traders kit includes the same software and data products as our Local (Premium) ASX Traders Kit (2), with the addition of Justine Pollard’s bestselling Smart Trading Plans book + her Smart charting 101 online course and her Maximising Metastock online course. Please click here to learn more about Justine and her trading courses. (3) A Traders Kit that includes Reuters Datalink Asia/Pacific online data. Our Local ASX data is the recommended choice of the two data services if your main objective is to trade ASX stocks. All Traders Kit packages are discounted and provide everything you need to get started trading with Metastock. We GUARANTEE you will not find a better value Metastock and data package anywhere. We also provide quality friendly after sales support to ensure you get value for your purchase. Please read below for a full list of what is included in each of the three Traders Kit packages. When you purchase a Traders Kit package, you receive everything you need to start trading successfully with no ongoing costs for 12 months. The Ultimate Traders Kit includes the latest version of MetaStock 16DC software, a 12 month subscription to Local ASX Equities data, including historical data (20 years) + the World and local Indices data package, Justine Pollard’s Bestselling Smart Trading Plans book , Justine’s Smart Charting 101 online course, Justine’s Maximising Metastock online course , our Oracle 7 Metastock add-on, Unleash the power of Metastock book and 12 months friendly local telephone and email support. In 12 months time, the data service will need to be renewed; this is the only ongoing cost. If you prefer to source your data from our local Australian data vendor and run Metastock offline the same as older versions of Metastock did, please purchase either the (1) Ultimate Traders Kit or our (2) Traders Kit with Local data or please call us on 03 9459 2317 for more information. We provide the best quality local data service’s covering the ASX and USA Equity markets + World Futures and Forex data at exceptional prices. Please note : The advertised (1) Ultimate Traders Kit and (2) Traders Kit with local data includes our ASX Equities + Indices + World Indices data for 12 months. Any additional data markets like USA Equities, World Futures and Forex can be purchased at any time, please contact our office for details. The ongoing annual cost for ASX Equities + Indices + World Indices data after the initial 12 months is $395.00. Metasock DC latest version 16 (Outright Purchase). The latest carnation of the iconic MetaStock brand. Hailed as one of the Top 10 Best Selling Finance Books in Australia by leading finance magazine, Money Magazine. Includes 10 online videos and a comprehensive handbook that will teach you why technical analysis gives you that extra edge in the market. You will learn how to determine significant reference points on the chart, define the overall health of a share by its trend and understand the market stages that shares move through. You will then put all this knowledge together into sound entry and exit techniques that will assist you in getting started in technical analysis trading and provide you with an additional edge in the market. The Maximising MetaStock Online Course will help you get MetaStock set up and streamlined. The course comes complete with a detailed workbook and online videos that teach you everything from understanding the basics like setting your local data, integrating it into MetaStock and creating templates, right up to the advanced functions such as understanding the MetaStock Formula Language, how to build your own indicators, how to set up explorations and how to take advantage of the Expert Advisor. Oracle 7 is a MetaStock add-on. 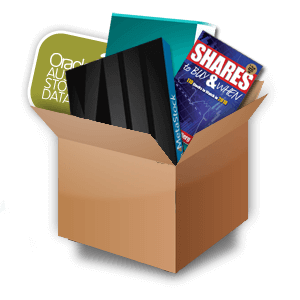 Oracle 7 consists of seven finely tuned scans that boost the power of MetaStock. These scans have been specifically created for the Australian share market. Having the Oracle 7 add-on means new MetaStock users can start running quality searches on the ASX within minutes of installing the software. These searches have been designed to filter out the vast majority of stocks on the market and to highlight only the best candidates for additional research. Premium ASX Historical data back to 1992. Price & volume data back to January 1992. All securities adjusted for capital events (splits, consolidations, capital returns, spin-offs etc) in a consistent manner. No data gaps for periods where stocks changed code whilst trading in “deferred settlement” mode. Separate folder for “Warrants” to reduce clutter. Unleash the power of Metastock 16 book. It’s time to unleash the POWER of MetaStock Daily Charts – featuring the new MetaStock FORECASTER. From the basics and beyond, this manual/video combo walks you through the process of finding the trades that have the greatest potential. It’s perfect for new MetaStock users, and a great refresher for the more experienced clients. It also includes over 2 hours of online HD video instruction by Kelly Clement – MetaStock Expert. Helpful, friendly local support to assist along the way. The latest carnation of the iconic MetaStock brand includes some massive enhancements over older versions, at the top of the list are these two additions Offline Mode and Local Data. Thomson Reuters data is now fully integrated so you don’t actually have to download data anymore if you run Metastock online (connected to the internet). Simply type in the stock symbol you want and the chart will automatically appear. This saves you having to worry about updating or maintaining your data. Worldwide and local indices covering over 100,000 symbols including the ASX 200, All Ordinaries, Australian sector indices, Dow Jones, NASDAQ, Nikkei, FTSE, DAX CAC and many more. Thomson Reuters historical data is fully adjusted, and covers approximately fifteen years on most markets including the ASX. Subscribers to the Asia Pacific Region get access to the following exchanges: ASX, New Zealand, Bombay, Malaysia, China, Sri Lanka, Taiwan, Hong Kong, Indonesia, Japan, Korea, India, Thailand and more.